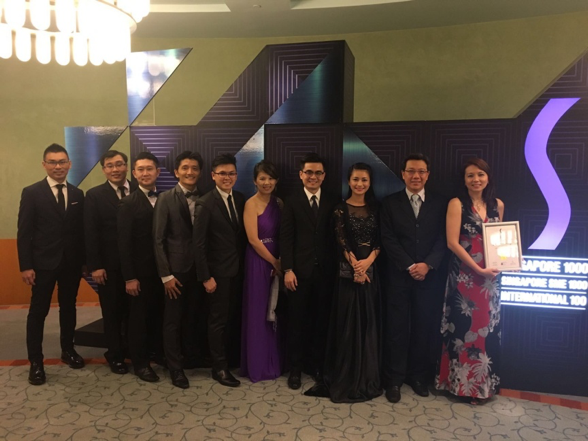 Singapore, 26th February 2016 – The 2016 S1000, SME1000 incorporating SI100 Gala Awards Dinner was held at The East Ballroom, Resorts World Convention Centre Sentosa where they announced their 2016 Award winners. Transition Systems was recognized and received a prestigious accolade from the Guest of Honour, Dr Koh Poh Koon, Minister of State for Trade and Industry. Transition Systems is honoured to be awarded as Singapore SME 1000 Company for its excellence performance in Business Growth. Agile Distribution Singapore) , Mr Jason Tan (Team Lead, Transition Systems Singapore), Mr Anthony Mak (Business Manager, Transition Systems Singapore), Mr Darren Chen (Technical Manager, Agile Distribution Singapore) , Ms Tricia Yeo (General Manager, Data Centre Transformation and SDN Division, Agile Distribution Singapore), Mr Robin Ong (Channel Director, Transition Systems Singapore), Ms Sylvia Go (Channel Account Manager, Transition Systems Singapore), Mr Jonathan Juay (Managing Director, Transition Systems Asia) and Ms Serene Siow (Managing Director, Transition Systems Singapore). ​The Singapore 1000, Singapore SME 1000 and Singapore International 100 awards are annual corporate accolades based on the financial performance of Singapore incorporated companies and small & medium enterprises (SMEs). The Singapore 1000 recognition is annually conferred to deserving recipients who demonstrate exemplary financial performance in their field and among their peers. Awardees will also need to exhibit qualities which define them as outstanding corporate citizens. The initial shortlist of award candidates is prequalified through their financial performance in the respective categories. Candidates must be profit-making over the ranked period. Corporations who experience gross negative growth will not be considered for an award. In addition to their financial achievement, this shortlist is then further judged on a set of criteria which demonstrates the company’s commendable corporate citizenry standards. Apart from financial indicators such as Sales/Turnover, Net Profit After Tax and Return on Equity, regulatory compliance is a key evaluation criterion in the awards nomination process for the Singapore 1000 Family of Awards (since 2011). Transparency and accountability are critical components of good corporate governance. The criterion for regulatory compliance takes reference from the rating of companies under the Accounting and Corporate Regulatory Authority’s (ACRA) colour coded compliance rating. The criterion encompasses three important statutory requirements under the Companies’ Act: the timely holding of the Annual General Meeting or AGM (section 175); laying of up-to-date financial statements at the AGM (section 201); and the timely filing of the Annual Returns (section 197). The corporate governance criterion adds an important dimension to the awards as good corporate governance ensures that the business environment is fair and transparent and leads to sustainable business performance. Companies that have received the award in the same category for 3 consecutive years will not be considered for the subsequent 2 awarding years. Instead, such companies will be conferred with the honorary award for the first year. The screening process is undertaken by the Awards Steering Committee consisting of representatives from DP Information Group, EY, Singapore Business Federation, IE Singapore, SPRING Singapore, ACRA and IDA Singapore. The steering committee must concur, by majority, on the most deserving candidates for the particular recognition of the Singapore 1000, Singapore SME 1000 or Singapore International 100 award. DP Information Group (DP Info) is Singapore’s leading provider of information, analysis and intelligence on the Singapore corporate sector. The company is part of Experian, one of the world’s largest credit reference agencies. With an unparalleled database on the performance of Singapore companies and access to the world’s best analytical services, DP Info uncovers the meaning and significance in data and gives its customers the knowledge they need to make better business decisions. DP Info offers a range of powerful tools for assessing the credit worthiness and financial health of both companies and individuals. The company also specialises in providing knowledge to, and intelligence on Singapore’s SME community. DP Info is an ISO/IEC 27001 Information Security & Data Management certified company.